We strive to provide juices that taste good, are good for you, and add balance and nutritious convenience to your busy lifestyle. Don't have time to sit down for a nutritious meal? There is anywhere from 1.5 pounds (citrus juices) to 3.5 pounds (green & roots juices) of fruit and vegetables in just one 16-ounce bottle. Our passion for quick and healthy alternatives resulted in a menu filled with delicious tasting juices, milks, and immunity shots that fuel the body with natural energy and make sense with even the busiest lifestyle. Stop in and drink to your health today. 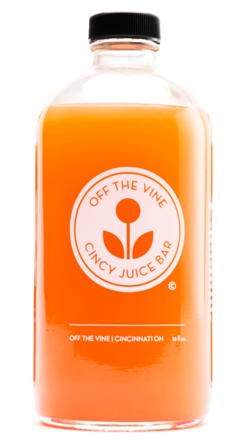 To learn more about OTV, cold pressed juicing, and cleansing, please visit our FAQ page.